Great Outdoors America Week | Discover, celebrate, and protect America’s green spaces and wild places. 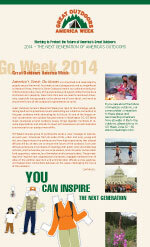 GO Week, June 23 – 26, 2014 in Washington DC. Let our leaders know how much we care about America’s Great Outdoors. Great Outdoors America Week (GO Week) is the preeminent event celebrating our collective connection to the great outdoors while advocating for its future. As one of the largest annual conservation and outdoor focused events in Washington DC, GO Week raises awareness around outdoors issues, brings together hundreds of diverse organizations and activists to meet with lawmakers and administrators to advocate for our outdoor way-of-life. The Next Generation of America’s Outdoors In a year when many conservation and outdoor organizations will be celebrating the 50th Anniversary of the Wilderness Act and honoring the work that has been done to protect the outdoors it is equally important for us to focus on the next generation of outdoor enthusiasts and the future of our outdoors. GO Week 2014 will focus on “The Next Generation of America’s Outdoors.” From young people working on the land through conservation corps, to organizations working to get more young people outdoors, to conservation organizations working to engage the next generation of public land supporters, inspiring and creating the next generation of outdoor enthusiasts is critical to the future of our young people and America’s outdoors. If you care about the future of America’s outdoors, our communities’ connection to these places and reconnecting Americans from all walks of life to the outdoors, please join us in GO Week, June 23 – 26, 2014 in Washington DC.